A Chest is a essentially an Item (see NonSolids) which has hitpoints, must be opened via attacking it and plays a neat animation when the item is finally obtained. Use tmx object property item (string) to specify the kind of item the chest contains. Currently maxhealth, ability0, ability1, ability2 etc. are meant to be used by the chest. Use property small (boolean 1 or true) to make the chest small and enable it to be opened by jumping on it. Use property hp (integer) to specify how many hitpoints the chest has. Remember to use tmx property id (string) to specify a globally unique id for this chest if you do not want the player to acquire it’s contents twice. Launches the player into the air when the player comes in contact. Use tmx object property strength (floating point) to specify how much to launch the player. Around 50 is a reasonable starting value. Use property vector (two floating points separated by a comma) to specify the vector along which to launch the player. A Platform is a solid rectangular object that can move along a path and which the player can land on. Use tmx object property movement (vector of two floating points separated by a comma, measured in tiles) to specify the one-way movement that the platform will take. Use property repeat (boolean 1 or true) to make the platform perform a round-trip journey and repeat indefinitely. A protocol for door-like objects. Inheriting from this protocol means an object can be opened with a trigger, like on an enemy’s death. A Door is a solid rectangular object taking it’s x, y, width and height from the tmx object. It can be opened using a trigger or by its hitpoints reaching zero. Upon opening, it immediately becomes a non-solid object. Then it either slides open in a given direction or explodes into many Debris objects. Use tmx object property color (0-255, 0-255, 0-255) to specify the RGB color of the door. Defaults to the color of the current Level. Use property sprite (string) to specfiy the filename of a sprite (or spriteframe) to use like a decal. If not specified, the Door is a colored rectangle. Use property hp (integer) to specify how many hitpoints the Door has (used with activate). Default: 1. Use property activate (string) to specify a class which causes the Door to lose hitpoints. Only the class missile is currently implemented, which causes the Door to lose hp when hit by the player’s projectiles. Use property explode (boolean 1 or true) to explode into Debris objects when triggered to open. Use property sound-open (string) to specify the filename of a sound to play when triggered to open. Use property duration (floating point) to specify the duration in seconds for the open animation. Use property shake (boolean 1 or true) to shake the screen after the Door has been triggered open and the duration has passed. When the knight is knocked-out, the door will be triggered open. 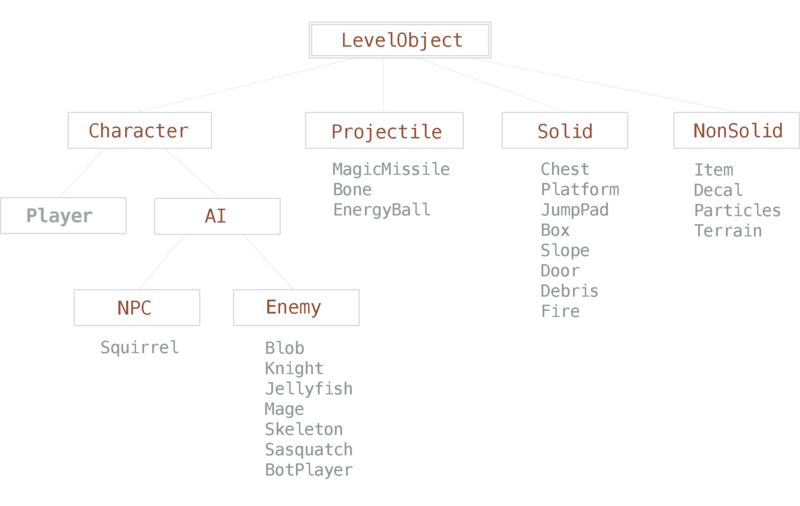 A piece of Debris is a solid object which collides with other Debris objects and solid fixtures, but not the Player or any other level objects. The Door class can be set to create a lot of these and sends them flying in the air when a opening. This creates an explosion effect, the Debris objects bouncing off each other and the Level. Use tmx object property hue (integer 0-359) to specify the hue. Use property direction (string left, right, up or down) to specify a direction for initial velocity. A degree of randomness will be added to the direction. Use object properties x, y, width and height to specify the Debris object’s shape and position. A Box can be moved around, used to jump from and blocks projectiles. Use object properties x, y, width and height to specify the object’s shape and position. Use property sprite (string) to specify the filename of a sprite (or spriteframe) to load. The Box will use the sprite’s width and height. If no sprite is specified, the box will be a solid rectangle. Use property color (0-255, 0-255, 0-255) to specify the RGB color of the box. A solid object animated with Flicker and particles to resemble fire that damages Characters who come in contact with it. Default damage 1. Use object properties x, y, width and height to specify the object’s shape and position. Currently Fire is a square, so it uses width also as a height. Use property damage (integer) to set the damage dealt. Use property color-max (0-255, 0-255, 0-255) to specify the maximum RGB color of the flicker. Use property color-min (0-255, 0-255, 0-255) to specify the minimum RGB color of the flicker.